ScoutView is a productivity-boosting software for the Commander™ 7 HDD Guidance Display. With ScoutView, you can upload your Field Scout™ bore plan to the Commander 7 screen and monitor the bore in real time. In addition, it enables you to log bore data and display bore info when approaching a waypoint/obstacle—all from the drill seat during the bore. When the bore is complete, you can use Field Scout™ to download the completed bore to your mobile device, where you can email your plan and As-Built to a supervisor, owner, or client for approval or further action. With ScoutView, you can reduce your risk and make your drill time more efficient, improving profitability on every bore. 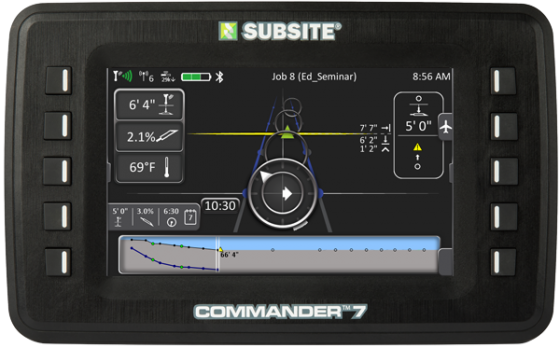 To order ScoutView software for the Commander 7, please contact your local Ditch Witch dealer or Subsite Electronics at 1-800-846-2713. Commander 7 HDD Guidance Display.